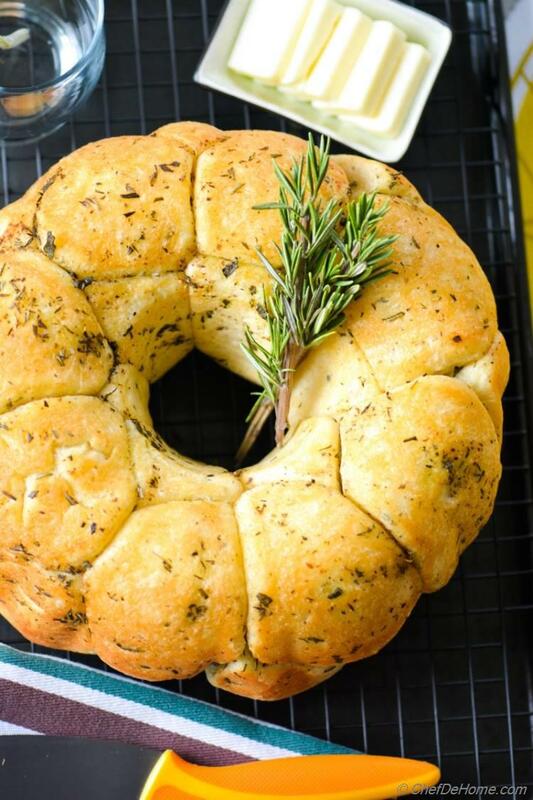 Or a gorgeous Festive Herb-Bread Wreath, if you wish to call it so! A good baked bread is baker's pride. I don't know if someone said so, or I just became famous ;) Either ways, I am sharing with you a delectable, homemade, fragrant, moist, herbaceous, and crusty monkey bread. 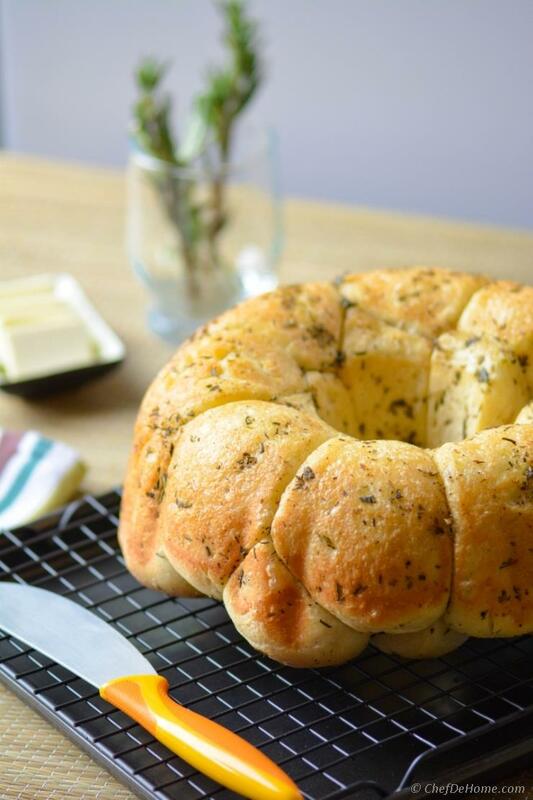 Slathered in butter and fresh herbs, this bread is perfect to bring some festivity on holiday dinner table! 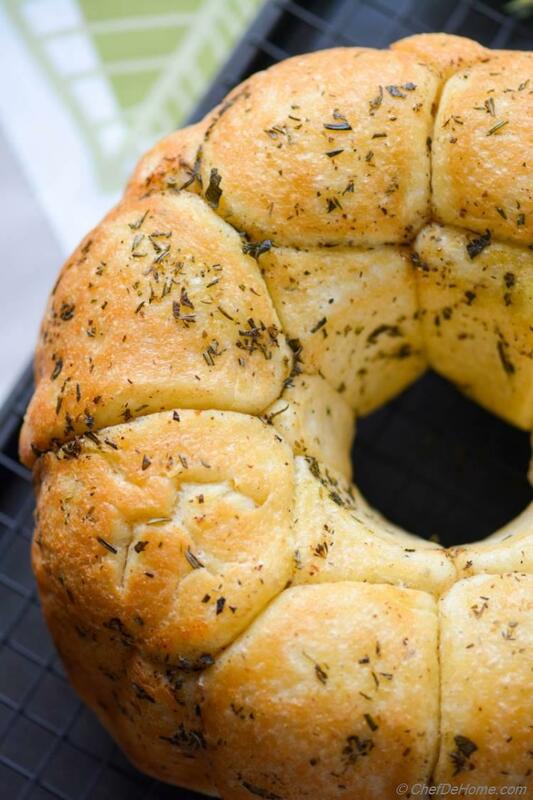 Monkey Bread or Festive Herb Wreath Bread? 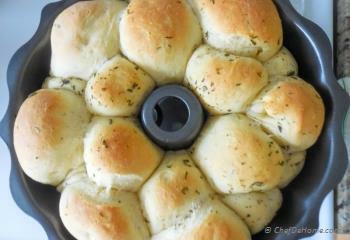 I am not sure.... if I should call this a monkey bread.... or Festive Herb Wreath Bread! confused...!.!.! It looks so gorgeous, seems unfair to call this a Monkey Bread. When I did some bing-ing to find the answer, turns out monkey breads are almost unknown to people outside America, and it is called so since it resembles the fruit of a Monkey Puzzle Tree. Original Monkey bread (introduced in 1950s) was sweet, made with small pieces of bread dough covered in cinnamon and sugar, then thrown in bundt pan and baked. But... these days everyone is making their own version of savory monkey breads and so did I. It is FINALLY raining in drought-struck California, and amazingly there was a warning of rain storm today! We have not seen much rain here in past 2-3 years, and all of sudden this rain is like overwhelming for some... specially in areas affected by fire in summer, now those areas are in danger of mudslides... problem when it rains... problem when does not.... Nature and humans, we will keep complementing each other till eternity! 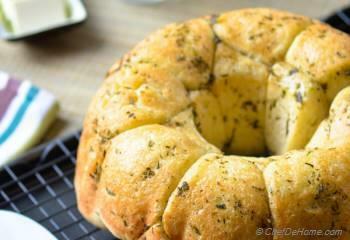 Back to my herb monkey bread! 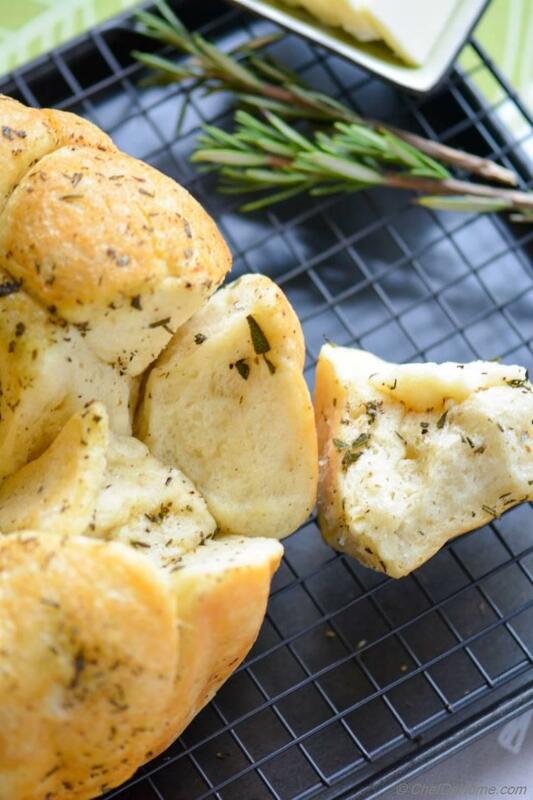 I have made this bread before, as simple dinner rolls with Italian Seasoning. When I need all sorts of herbs and can't find any fresh, I reach for my pantry staple, Italian Seasoning (unsalted)! Thing to remember is, dried herbs are more potent than fresh-ones. So always add less if using dried herbs vs fresh. e.g. 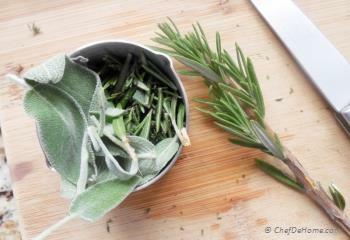 for this recipe I have used, 1/4 cup mix of fresh thyme, rosemary, oregano, and sage. 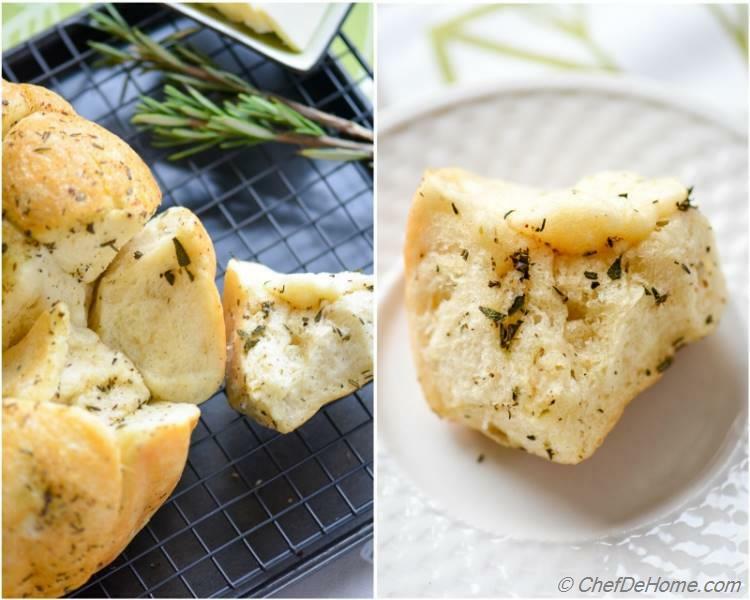 If using dried, add 1/2 tbsp of seasoning to dough and use 1 tbsp for covering dough with butter-herb mix or adjust per taste but you will never need 1/4 cup dried herbs for this one bread. 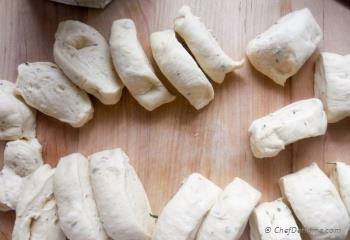 Bread dough uses NO butter at all, just 2 tablespoons of olive oil. I only used butter to get buttery, crusty exterior. 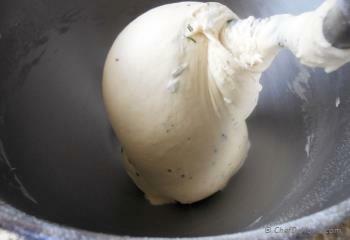 If you want to totally avoid butter, dip dough in oil and herb mixture instead of melted butter. 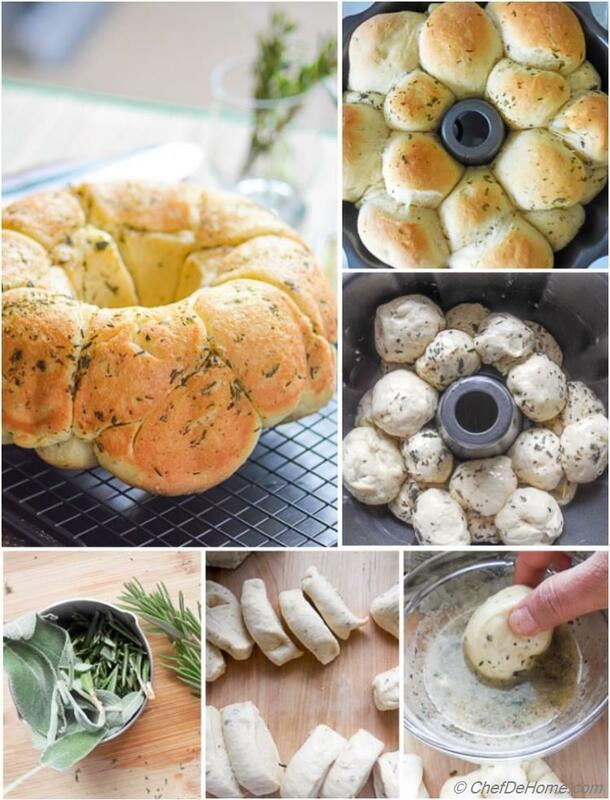 This bread is essentially a family-style pull apart bread. Just take out of pan, cool a bit on wire-rack, then serve as-is for a rustic family-style dinner party. Here are few shots to share the texture of bread. The outer crust was very buttery, crusty, and inside was warm, moist and fluffy! So, don't wait, make this yummy bread for family over the weekend and if you need some easy soup to accompany, I am sharing the recipe next! Total Time 40 minutes Prep Time 20 minutes Cook Time 20 minutes Difficulty Easy Yields 1 Monkey Bread Serves 8 Notes Idle Dough Rise Time - about 2.5 hours. Smart Swap Can't find fresh herbs? Use 1.5 to 2 tbsp Italian Seasoning instead of fresh herbs. 1. In a wide bowl, add 3/4 cup + 2 tbsp lukewarm water, dissolve 2 tbsp sugar and sprinkle yeast package on top and let it bloom for 10 minutes. If yeast does not bloom, discard and start afresh. 2 tbsp additional water was funny accident. I already had 3/4 cup water in bowl, and this 2 tbsp just made it's way into bowl while my head was busy banging onto a half-open-spice-closet, just above my kitchen counter... so.. sorry for this awkward measurement. 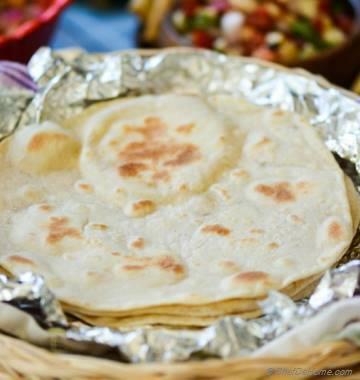 You can always add just 3/4 water and adjust flour as per need. 2. 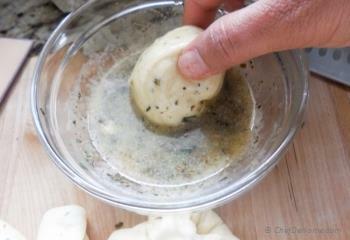 While yeast is blooming, fine chop herbs, divide in half. Also lukewarm milk. 3. 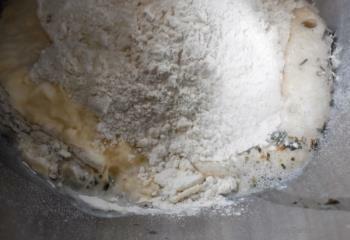 In yeast, add lukewarm milk, salt, olive oil, half of the fresh chopped herbs, and 2.5 cups of flour. 7. 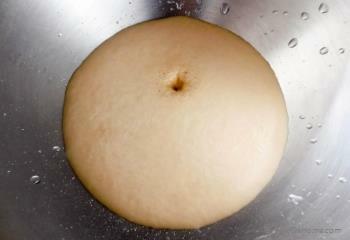 Punch down the dough and transfer to a work surface. Make two logs long logs. 9. Divide the log into 20-25 equal size portions. Also, in a saucepan, melt the butter, add remaining herbs, mix and set aside. 10. 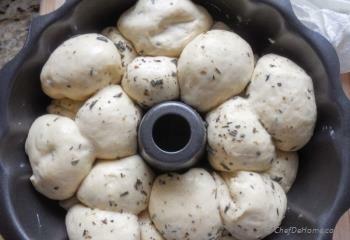 Shape each dough piece into a ball. 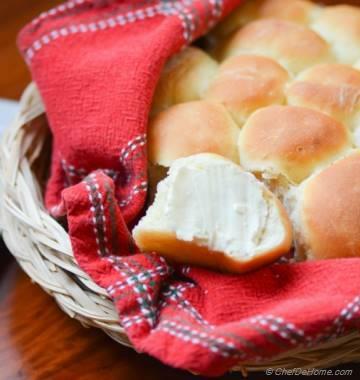 You can also leave'em as is since it is a monkey bread, no need to be very precise, but if you want to, make all balls before dipping one into butter, or otherwise butter covered hands will make it impossible to roll the dough balls. 11. 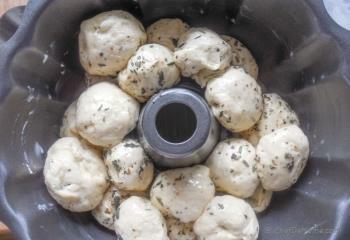 Transfer all the butter-herb covered balls into bundt pan. 12. 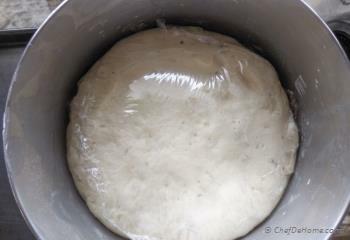 Second Rise - Cover with dry kitchen towel and leave to rise in warm place for 1 hour or until pan is just full. 13. Preheat oven at 375 F, then bake for 18-20 minutes or until top of bread is golden brown and bread sounds hollow when tapped. 14. 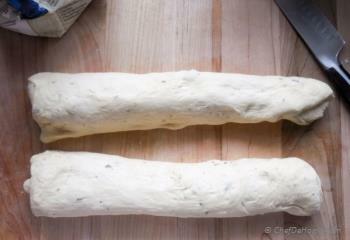 Carefully invert bread onto cooling wrack and let it cool slightly before serving. Monkey bread freeze well, both cooked/uncooked. 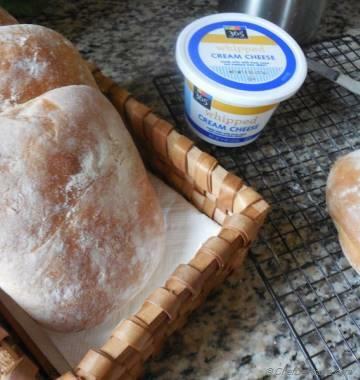 For cooked bread, divide the bread into few parts, wrap in plastic wrap, add to ziploc bag and freeze. For reheating, warm in microwave at 1-2 pizza warm setting. 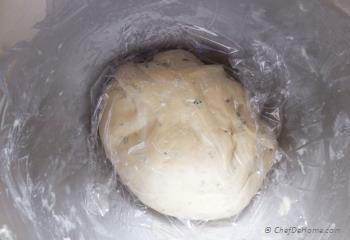 For uncooked dough, after first rise, freeze the dough. When ready to bake, thaw the dough on kitchen counter, divide into pieces, then follow the second rise and bake steps from directions above. For more crusty bread, leave bread to rise in refrigerator for second rise. Hi...I made this monkey bread last night. I Love it :) thanks .Very easy to follow recipe and it is delicious. Hi Jakie, I'm glad you enjoyed Monkey bread. Thanks for sharing sweet feedback. Thanks for this recipe! I have made it many times already and it always gets compliments. I always think I might freeze some but there never any left over. Cristina, thanks! 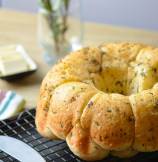 This is one of my favorite savory monkey bread! No wonder you never have leftovers! Thanks for sharing your experience with us. Thanks, Gauri! I hope you like it if you get chance to try. That's a very beautiful looking bread! Pinning to try later!